I only found out this was a retelling when I finished the book. 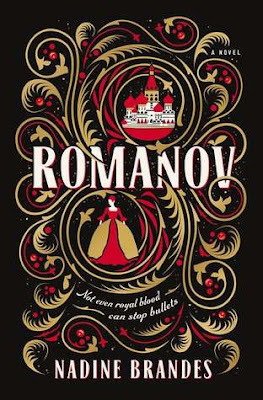 I'm curious right now, what happened with the Romanov family and will definitely dive into history to learn the real story. I like the magic system in this book and I also liked the writing style. I did feel the book was a bit too long for the things that were happening and I didn't have that great of a connection with the main characters. So that's where my 3 stars come from. What just happened: At some point in the book there is a BIG WTF moment. Especially if you do not know the history of the Romanovs. I perked up and was curious what was about to happen after this scene. Papa: This is by far my favorite character. Nastya has such a special connection with him and I felt like this was a special character as well. The way papa talks about other people and treats them is how the world should be. Forgiveness: At the final parts of the book, forgiveness is a big topic. I really liked the way the author was able to capture this. I felt like I could learn from this and I was touched by the way Nastya thinks about forgiveness, learned from her papa. Magic system: So cool, because the magic wasn't that big part of the book, but it was a big part as well. It's not that magic has the upper hand in this book and I liked the way spells have to mature and you need spellink to make the spells. It was just the right portion of magic for me. Dull: The biggest part of the book was, to me, kinda boring... Not much was happening and it took a lot of time to build up to the big plot twist. I wasn't going to DNF the book, but I felt like something needed to happen to spice the book up. Luckily something happened! Shorter: I think the book would've been better if it was shorter. The dull part would have been shorter and I would've been able to give the book 4 stars that way. Main character: At some point Nastya doesn't know what she wants and it is annoying to me. She is described as fierce and not afraid, but she can't make up her mind at some point and that's the reason I didn't feel a connection with her. A book with big plot twists and an unique magic system. I love how forgiveness is a big part of this book and it can really inspire you. Some parts of the book were not fast paced enough for my taste, but not bad. I would definitely read something by this author again. "Brandes' accuracy in this retelling -- the majority of the characters and events are true -- and the bits of Russian sprinkled throughout are highlights. A promising retelling." "This book completely hooked me from the start and did not disappoint with twists and turns and magic and romance that added new elements to the story we know." "I took his hand. "It'll be okay. This will help you." For now. "I will save you." Maybe. "I love you." Always." "I know," my lips said. I know, my head said. I want him, my heart said." "But there was still light - we were just learning how to find it."